I finally did it. I finally had a chance to look through the books properly. It was then that I realized two are beyond my understanding as they were made for those who actually study art. It was either that or my frame of mind was not in the right place to look at them. The other book was good, I think I shall extend it's time from the library so I can do the activities it suggests. It has a heap of progressive activities which I shall aim to take advantage of. All that aside, I took my child free time to draw my youngest. Admittedly it is not the best but I am still happy with the result that I achieved in the small amount of time I had available to me. She looks like a mad professor with the hair, and wouldn't stay still despite being asleep. 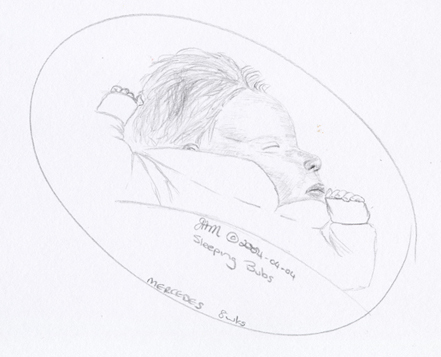 Here she is, my bouncing baby girl, well sleeping baby girl.